An ode from ham to ham. "Stand aside, everyone! I take LARGE STEPS!" A ridiculously larger-than-life character typically played by a guest star with an Internet Movie Database listing longer than the rest of the cast put together. Full of energy, joie de vivre, blood as hot as the surface of the Sun and poetically powerful speeches with dramatic gestures that can devastate a scene to a billion pieces and transform the most soul-crushingly boring into the most EPIC. They usually lack an indoor voice, and greatly relish badass boastings where they can punctuate! WORDS! FOR! EMPHASIS!!!. The first line from the Large Ham will be dramatic, portentous, often just before the act break and can almost always be replaced with: "Did somebody order A LARGE HAM?!" Try it at home; it's great fun. Popular implementations include: Brian Blessed in Britain, William Shatner in North America, and Norio Wakamoto in Japan. Many large hams in the past have some experience in stage acting and theater: when you have to poetically act for the back rows (especially when coupled with music) it makes sense. Having an outrageous appearance is helpful but not a requirement. While often male, female actors can pull it off, but it's rarer for them. Often cast as a One-Scene Wonder, or a key redeeming element in shows that are So Bad It's Good. The origin of the term is unclear: is either from the use of hamfat as a cheap make-up remover in the old days of theatre, or because "ham" serves as short for "amateur" (as in ham radio); Leslie Charteris stated it derived from "Hamlet" in a The Saint short story. Another possibility would be from the description of a "hamfisted" way of handling a situation. One of the United Kingdom's most active export industries. If a character is depicted as an American in a BBC series, he's likely to be one of these. 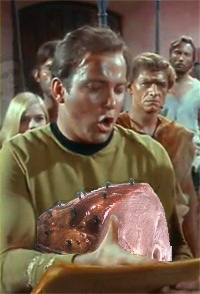 If in a few scenes many Large Hams come together, the likely result is Ham-to-Ham Combat. Large Hams are a very rich source of Vitamin Memetic Mutation and very often feature in YouTube Poops. While Narm is their primary flaw, the large hams are likely to have come from Hillshire Narm (Go Keet!) But more often these actors are Narm Charm. A Large Ham may occasionally be Crazy Awesome. Often a character trait of the Boisterous Bruiser. Villainous Hams also enjoy getting Drunk on the Dark Side. A Smug Super relishes showing off their power this way. If it is the setting itself that seems to demand that ham is served in profusion, dipped in abundant Hot-Blooded, because it's just how the setting works, you may be in front of a World of Ham of Ham: those can provide for marvelous entertainment, if your Willing Suspension of Disbelief is elastic enough. Compare Melodrama, Ham and Cheese, Milking the Giant Cow, Camp, Evil Is Hammy, Incoming Ham, Ham-to-Ham Combat, Drama Queen. Contrast Danger Deadpan, The Stoic, Soft-Spoken Sadist, The Quiet One. Just so it's noted, just because a character/actor is hammy does not mean they are bad or ridiculous - far from it! This page was last edited on 11 February 2019, at 15:12.